Like all public spaces, The Photographers’ Gallery, in London also has private spaces. Above one of the galleries is a small room that is inaccessible to the public, whilst affording a clear view of the whole gallery via a small window. Occasionally, visitors to the gallery might see staff climbing the steep steps and taking part in unknown activities. This piece involved the artist working in this space for a month on a site-specific photo project. This room became the set where the narrative was written or where a given story unfolds. 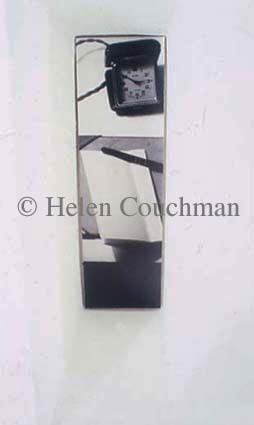 Whilst using photography the artist’s interest lay in the processes that were not recorded by the image. The objects involved became a still life, yet at the same time the viewer of this piece became the detective, putting the actions, places and times together to make the piece. In a voyeuristic position the artist became the detective – not of others but of detective-like thoughts, images, books, films, of ‘making the next move’ and of the apparent conspiracy of spending time in a small dark room. Another consideration was the surface of the gallery wall as a membrane between what is displayed inside the exhibitions space and the structure of the gallery as an institution behind the scenes. 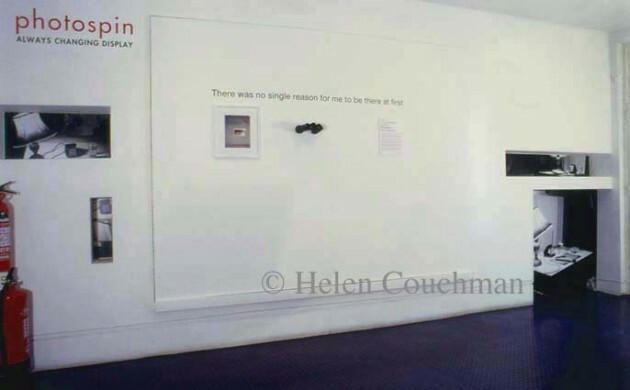 In this installation each black and white photographic panel was recessed into the wall of the gallery by approximately 20cms. A framed colour photograph taken of the small window as viewed from the public gallery hung upon the wall next to a pair of binoculars. Photography was invented, detective stories became a genre recognisable around the same time. The coincidence of these two cultural components is investigated in this installation.